Jeanne Stroh joined SSOR in July of 2014. 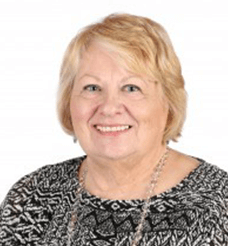 A native of Wisconsin, Jeanne has lived in Kansas City for a number of years and has worked in administrative roles at Clarence Kelley and Associates. Jeanne understands how important physical therapy is in a successful outcome as she has had knee replacements. She believes that an atmosphere that is conducive to healing is very important and she is committed to helping the staff at SSOR facilitate a positive atmosphere.